See my column in the February monthly print issue for one of my favorite stories from my time visiting Memphis during the third week of January. I was honored to receive the Keeping the Blues Alive award for Journalism from the Blues Foundation at a luncheon that featured 15 recipients in various behind the scenes categories. Everyone had a personal story of how the blues had impacted them and in many cases literally changed their lives. It was amazing to be part of this group of blues lovers honored for following their hearts. Memphis is brimming in music history and Beale Street is overflowing with blues acts and blues fans during the International Blues Challenge (IBC). Blues artists come from around the world to be seen, heard and network in Memphis. The Keeping the Blues Alive awards are held in conjunction with the International Blues Challenge. I was honored to be asked to judge the IBC finals along with fellow KBA winner, legendary producer Mike Vernon. Other judges with me in the Band category were musicians Zac Harmon, Karen Lovely and Liz Mandeville and Alligator Records’ president Bruce Iglauer. Vernon was part of the solo/duo judging panel along with musicians Colin Linden, Hawkeye Herman, Andy Cohen and Earwig label president Michael Frank. Everyone was diligent in their judging duties and I can tell you it’s a very difficult task and you can’t help but be subjective even when you try your best to be objective. In the end, all that one judge can provide is their professional impressions of each act based on the judging criteria. At the end of a seven-plus hour day in which eight solo/duo acts and eight bands were scheduled to perform, the final judges’ votes put Vicksburg, Mississippi, representative Eddie Cotton and his soul-blues band in first place. Hot guitarist Noah Wotherspoon from Cincinnati (representing the Dayton Blues Society) took second place with his trio and also took home the Gibson Guitarist award for best guitarist in the Band category (again determined by judges scoring on a point system). Third place went to French artist Nico Wayne Toussaint’s band, who advanced to the IBCs through the Southern California Blues Society’s competition. My fellow KBA recipient Mike Vernon, noted for his early producing work with Eric Clapton and John Mayall’s Bluesbreakers and Fleetwood Mac with Peter Green along with many classic blues artists, later expressed particular enthusiasm for Noah Wotherspoon. I’d say this makes Wotherspoon a real odds-on act to keep an eye on in the coming year. The final solo/duo act was a curious no-show so the IBCs only awarded first and second place in the solo/duo category. Since I was judging the bands, I was able to just sit back and enjoy the solo/duo acts. Winner Randy McQuay was definitely my favorite. He performed representing the Cape Fear Blues Society and put on a musically diverse and engaging set that featured both a humorous singalong and a heart-felt ballad. When he won he literally kissed the stage floor. Second place in the solo/duo category went to Brian Keith Wallen representing the Dayton Blues Society. Wallen also played an excellent set. Ben Rice from the Ashland Blues Society took home the St. Blues Guitars’ best guitarist award, after performing with Lucy Hammond. Did I mention all the finals acts played mere 20-minute sets with 10-minute turnarounds? The pressure is on when over 250 acts have been whittled down to sixteen and only have 20 minutes to show what they can do. Playing in Memphis’ Orpheum Theatre definitely seemed to keep some of the bands I had seen sizzle the previous night perform a little more subdued sets. Blues Society of Omaha’s representative Hector Anchondo Band made it through to the semi-finals, which means they survived the cut from some 250 acts down to about 50 acts. That’s a big accomplishment. In the semi-finals round they drew a venue with several excellent bands, drew the final slot and played their best show of the week. They didn’t make it on to the finals but they said they received lots of positive comments from fans and fellow musicians and achieved their goal of making it to the semi-finals. I want to make note of Betty Fox and her band as an act I think is one to watch. Fox advanced to the finals from the venue that Anchondo played, where she wowed me and a packed audience. She is the real-deal with a big, beautiful voice, dazzling star quality, plenty of heart and a band to match, particularly the dynamic Kid Royal on guitar. Fox represented Florida’s Suncoast Blues Society. Keep an eye out for her. See bettyfox.net. Your next chance to see the Hector Anchondo Band here at home is Friday, Jan. 30, at The Slowdown as part of a benefit for Josh Lorimer, currently on the kidney transplant wait list. Anchondo performs along with a number of other local artists 730-midnight. See details at facebook.com/events/397736697068688. Follow Anchondo at hectoranchondo.com. The first show out of the gate this week is the wonderful Texas troubadour Randy McAllister and his crack band, throwing down a great mix of original roots sounds in the service of his fine songwriting. McAllister always puts on an entertaining show. Catch him at The 21st Saloon Thursday, Jan. 29, 6-9 p.m. Next week the 21st Saloon presents singer-guitarist Shannon Curfman Thursday, Feb. 5, 6-9 p.m. Curfman broke onto the scene a decade or so ago as a talented teen and is now back on the road as a bandleader. 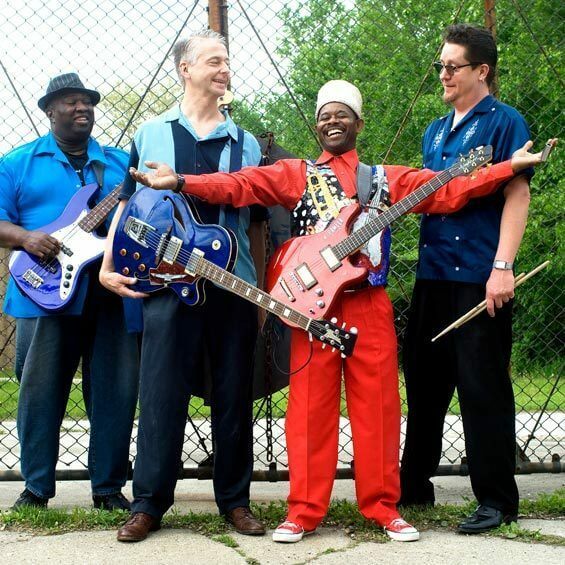 Lil’ Ed & the Blues Imperials hit Lincoln’s Zoo Bar Saturday, Jan. 31, 6-9 p.m. with special guest J.R. Clark filling in for Mike Garrett. Garrett, Ed’s longtime second guitarist, suffered a heart attack Jan. 7 and had quintuple bypass surgery on Jan. 8 in a hospital near his suburban Chicago home. On Jan. 13 he was allowed to go home and he is working toward a full recovery. On Jan. 27 his wife Lisa wrote “Mike had some good news today, His home health nurse told him that he is progressing so well that she no longer needs to come to see him. On another bright note Mike is starting to feel well enough to play his favorite Gibson. He is chomping at the bit to get playing.” See gofundme.com/kbeon0 for updates. Young Hayden Owen was injured in November when he tried to climb up on a dresser and it fell on top of him along with a tube television. He is currently at the Madonna Rehab Hospital in Lincoln where he is relearning basic motor skills. Several local bands are joining forces at The Sydney Friday, Jan. 30, 9 p.m. to raise money to help with the Owen family’s expenses. Performers include Matt Cox, The Willards, Jeremy Mercy and The Pink Flamingos. Admission is $5. Josh Hoyer & The Shadowboxers are at #2 on the Roots Music Report’s Top 100 Soul Album Chart for 2014, behind Sharon Jones & The Dap Kings. See rootsmusicreport.com/charts/view/album/sub_genre/soul/yearly/2014. The band is currently on a southern and upper Midwest tour in support of their second disc, Living by The Minute (Silver Street Records) that is taking them from Texas and Louisisana to New Orleans, Florida and through Chicago. See joshhoyerandtheshadowboxers.com.